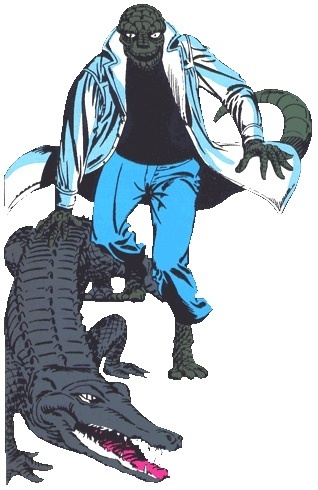 Comic-Con 2011 may have hit its biggest reveal today with the first footage of The Amazing Spider-Man's central villain, the Lizard in Hall H.
One of Spider-Man's earliest villains in the comics, the character, created by Stan Lee and Steve Ditko, made his first appearance in "The Amazing Spider-Man" #6. A herpetologist, Dr. Curt Connors inadvertently transformed himself into the reptilian beast while trying to re-grow a missing arm. In the footage, we see Rhys Ifans talking to Peter Parker's (Andrew Garfield) class about his studies to do exactly that. He's working for Oscorp and Gwen Stacy (Emma Stone) appears to be his lab assistant. Another scene has Connors standing with a mirror in front of him, trying to imagine his body with two arms. He takes a drug in his lab and begins to transform, first successfully re-growing a human hand and then growing scales up and down his body. The big reveal, though, came with a final scene that started with two girls in a bathroom, talking about one of their recent breakups. Behind them, a toilet starts to bubble and then the floor around it begins to crack. An enormous hand emerges from the hole and we see the lizard for the first time in full. Apparently entirely CGI, the character goes back to the original Ditko look, though the character's body is much more muscular. He also, as is revealed in a shot where he sniffs the terrified girls, has a gigantic tongue. Below is an original piece of Ditko art. Hopefully, an official image from the film will be available soon, but check back soon for an exclusive interview with Ifans himself.